Every product from Galac-Tac is meticulously hand made to order to your custom specifications, therefore we do not offer refunds. We will accept exchanges for any products with a factory defect within 30 days of delivery. We will not accept returns for items that have been damaged after delivery. We ship all of our products via UPS if you live within the USA, Exports will use USPS. All shipping fees and taxes will be reflected in your final price. How long will it take to get my items once they have shipped? Orders shipped within the United States will take approximately 2-6 business days to be delivered. Orders shipped outside of the United States can take 1-4 weeks to be delivered. Once we have shipped your items we will provide you with a tracking number to give you a more precise delivery time. Why did I receive multiple shipments? To ensure the safety of your items we may split your order into multiple shipments. If we do this, you will be notified and provided with tracking numbers for each shipment. Can I purchase Ballistic rated versions of the armor? We currently do not offer any ballistic versions of our armor. 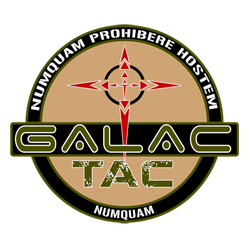 Where all can I buy Galac-Tac products? We have no distributors at this time, and only place to buy is from Galac-Tac.com. What all is included in the armor? Chest, Throat, Abdominal, and Shoulders. Yes. Click here to see if you qualify. What is projected completion time on an order? Taking into consideration that everything is handmade from Galac-Tac the time frame can vary. We also work on a first come, first serve basis, so that may increase production time per piece. Can a custom paint job be done? We only currently offer the original colors and battle damage effects. Can I purchase ear protection armor? Sorry, we currently do not offer ear protection.